Minimum 6 Maximum 30 people. 6-8 hours average day covers between 14 and 17 kilometres. dinner, bed and breakfast and a packed lunch. NB: Drakenberg weather can turn nasty at any time of year. 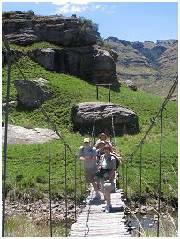 The Giants Cup Hiking Trail is part of the Drakensberg Park National Hiking Way. The hike is along a well established and clearly marked trail that runs southwards from Sani Pass in the north to Bushmans Nek in the south, the full trail being approximately 60km in length. It falls within the Ukahlamba Wilderness Area (a World Heritage Site) and is administered by KZN Wildlife who provide 5 overnight huts along the route - at Pholela (Cobham valley), Mzimkhulwana, Winterhoek and Swimans (in the Drakensberg Gardens valley) and at Bushmans Nek. Each hut accommodates 30 persons with basic facilities - bunk bed and mattreses, benches and tables, flush toilets and a supply of cold running water. They are normally used by organized group such as hiking club members who bring all their other requisites for the 5 day hike (eg sleeping bags, food, cooking equipment, lighting etc.). For less experienced and hardened hikers, who do not have the equipment or who are not prepared to carry a heavy pack with all their own food etc for 5 days, a new concept in "luxury hiking" or "slack-packing" has recently been introduced by private operators. This aims at making the hike a more enjoyable experience people for people who would like to walk the trail during the day and stay at comfortable lodges at night where all their meals are provided for. Professional Guiding and Back-Up Support. Pick Up from End Point of Hike. Underberg Hideaways has pioneered "luxury hiking" for the Giants Cup Trail and offers all of the above services for private parties of 6 to 10 hikers per group. Departures are organized for the spring and autumn months when the weather is predictable and mostly fine - outside of the summer thunderstorms and cold winters. Groups are welcome to form their own parties or join one of the scheduled hikes planned for March to May, or September to November. Contact Paul Colvin at pc@hideaways.co.za for more details. Participating lodges in the Giants Cup Hikeathon organised by Underberg Hideaways are Seaforth Country Lodge (in the Sani Pass area), Briar Lea (Cobham Valley) and Orchid Valley Lodge (Drakensberg Gardens). Hikes normally take over long weekends (Friday to Sunday) and include the best sections of the trail from Sani Pass to Drakensberg Gardens. Luggage transfers with daily pick-ups. Provided that you have a minimum of 6 hikers in your party, the Hikeathon can be organised for any time of the year subject to demand and availability of accommodation and tour guides. Best though to avoid peak holiday season (Easter, Christmas and long weekends) when accommodation is at a premium. 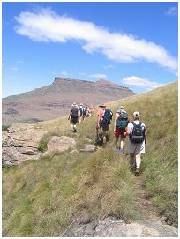 The autumn and spring months are generally an excellent period for planning hikes in the Drakensberg. Scheduled hikes through the Wildlife Society are organised each year, normally in March/April and September/October. Although the winter months are more stable, weather conditions can be extremely unpredictable in the berg at any time of the year. Sudden changes can occur bringing thunderstorms, cold, rain and mist which makes for unsafe hiking conditions. Hikers should therefore be prepared for any eventuality and should always carry protective rain gear and warm clothing. A full quotation will be given on enquiry and hikes can be customised to your needs (eg more or less days). The cost will depend on group size and whether a local community guide or DEAT registered mountain guide is used. Flora and Fauna : Most of the hiking trail traverses treeless mountains and Themeda grasslands, with a few scattered protea species and patches of montane bush in the protected river valleys. Although the Drakensberg has rich grassveld during the spring and summer months, the severe winters result in a dramatic decline in its food value and the area cannot support large populations of animals. Many species have adapted to these extreme conditions and are endemic to the area. None are plentiful but all are interesting. Antelope species that you may encounter include Eland, Reedbuck, Rhebuck and Oribi. There are about 200 species of birds in the region, including the endangered Bearded Vulture, Jackal buzzard, Black and Martial eagles and Secretary birds. Smaller birds such as sugarbirds, sunbirds and flycatchers are endemic to the area. Others are summer migrants to the region such as the blue and wattled cranes while several species including the fairy flycatcher migrate down the berg from Lesotho during winter. Day 1: (13km)After a restful night at Seaforth where you will gather for dinner the day before your hike, you will be transported to the start of the trail at the bottom of Sani Pass. The first objective is to cross the ridge between the Mkomazana and Gxalingwa valleys. Ngwenwa Pools is an ideal stop for lunch on a sunny day or, if it is raining, there is a cave a little further along the trail. After this the trail gradually ascends through attractive country into the Pholela valley, crossing a suspension bridge over the river to the Cobham reserve. You will be collected from this point for your transfer to Briar Lea farmhouse in the Cobham Valley where you will overnight. Day 2: (17km)This is the longest and most eventful day and you will need to make an early start to get the most out of it ! You will be transported to the beginning of the day's walk at Cobham and continue the trail which ascends the Sipongweni Ridge past Tortoise Rocks before traversing its southern flank and dropping down into the Mzimkulwana valley. You will see the Mzimkulwana Hut (normally the 2nd nights hut on the GC Trail) nestling beside one of the tributaries of the Umzimkulu. A good spot along the way is bathplug cave, named after a hole in the cave floor through which disappears. Observe but do not touch the Bushman paintings on the cave walls. Try and leave Mzimkulwana Hut after an early lunch in order to complete the remainder of the days hike which will first take you on a long climb towards Little Bamboo Mountain. On the top of the ridge you will find a number of small vleis (tarns) where blue cranes frequent and remains of petrified forests can still be found. The trail then continues down following a pleasant stream valley with tempting swimming pools, and finally reaches the tar road of the Drakensberg Gardens Valley where you will be picked up and taken to Orchid valley for the third night. Day 3: (13.5km)You will need to be guided out of Orchid Valley to pick up the marked Giants Cup Trail above Winterhoek Hut. The first half of the trail ascends the ridge to the west of Garden Castle mountain via the scenic but steep Black Eagle Pass. Be sure to fill your water bottle before you start as there is little surface water along this section of the trail. You eventually reach an altitude of about 1900 metres between the two river valleys of the Mzimkulu and the Mzimude and many pleasant vistas present themselves as you follow the contour path to the top of the Drakensberg Gardens. Near the end of the trail you will see Drakensberg Gardens hotel below you; follow the path down to the hotel from where you will be picked up. The Hikeathon ends here with the option of returning to collect your cars from Seaforth or spending an extra night at the lodge before returning home.